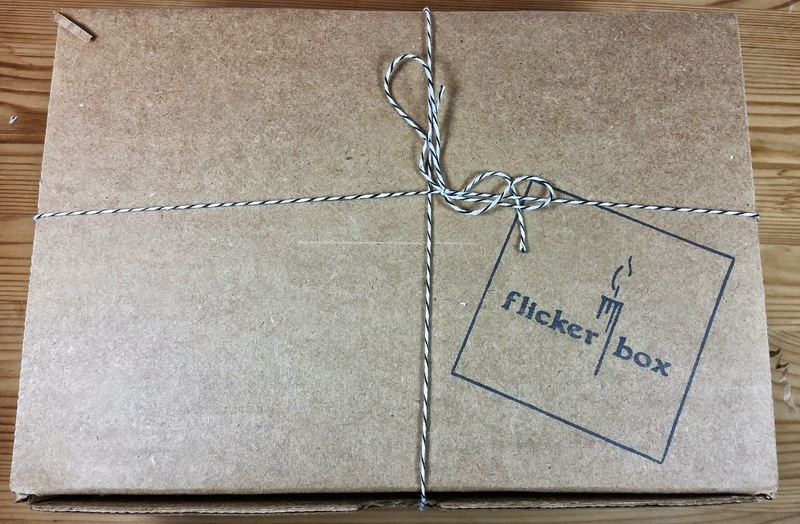 This is my first Flicker Box! I really do adore candles but I had hesitated on purchasing an actual subscription. This box is amazing! I'm not sure I want to go without a candle box ever again! What fantastic curation! This particular box was at a discounted price for review purposes. This might be my best discovery ever. What You Get: A carefully curated box of all kinds of unique artisan candles. 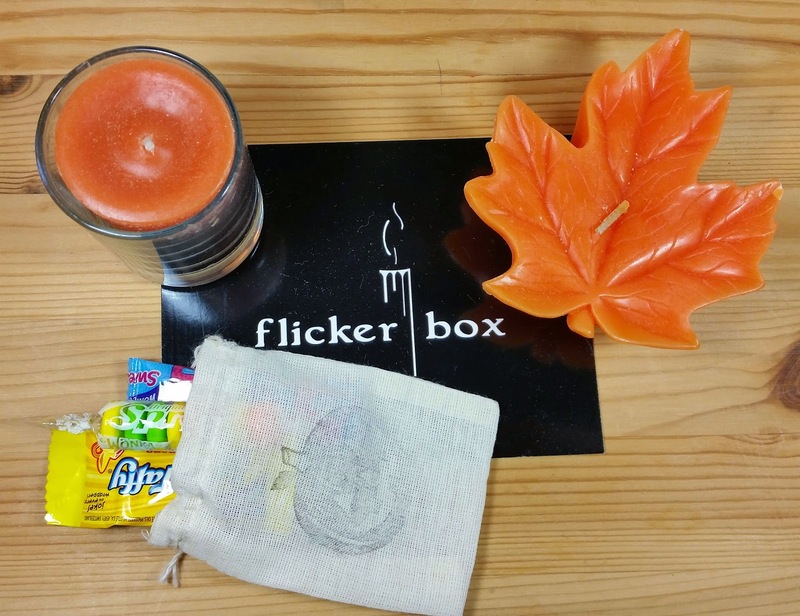 I can't tell you how in love with Flicker Box I am. I *love* the scents SO much. They are so appropriate for Fall. And Fall happens to be full of my favorite delicious smells. Think pumpkins and nutmeg. Clove and orange. Vanilla and cinnamon. Of course you can't leave out crunchy leaves, gorgeous golden yellows, burnt oranges and burnished coppers. I can't help it. Even though I have to rake up the leaves, I still love them. 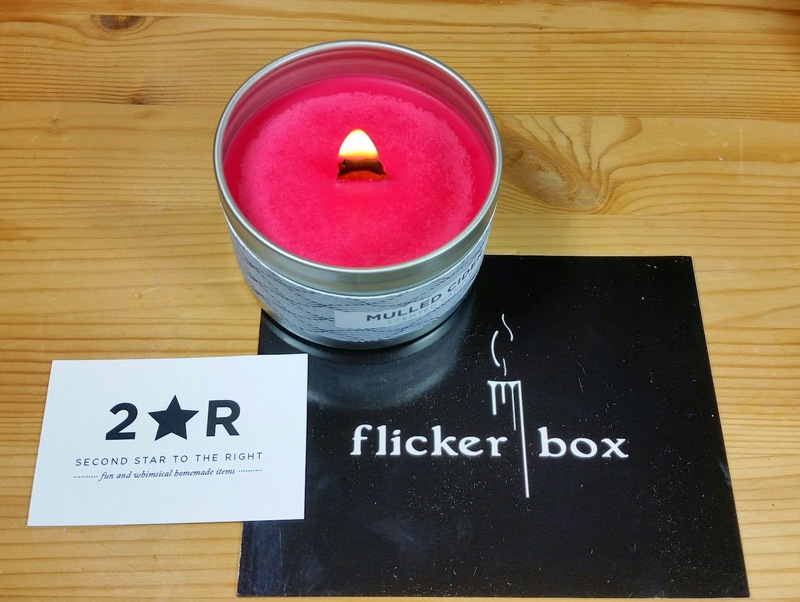 Second Star to the Right in Mulled Cider- This 8oz candle was handmade in Chicago and is made of all natural soy. It has a clear lid and the label is easily removable after the candle has finished. Which will be in a whopping 40 hours! This smells so delicious I wish I could eat it. This warm Mulled Apple Cider scented candle holds a welcoming aroma of hot cider spiced with cinnamon, cloves and nutmeg. It's also got a wooden wick, which I love. 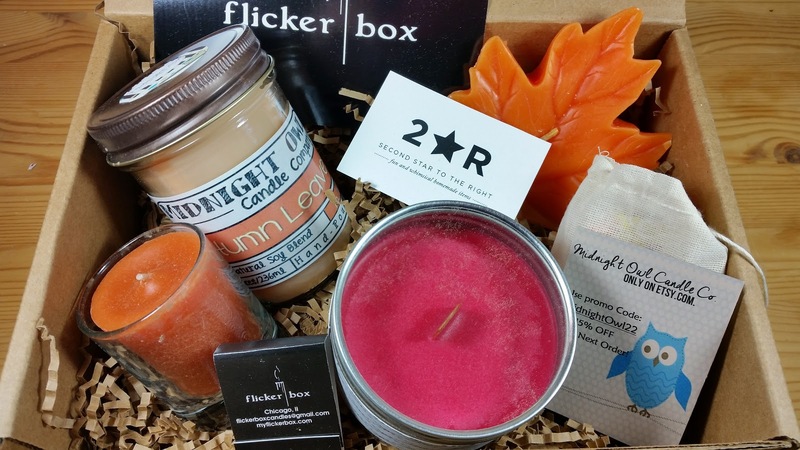 Rachelle of 2StarR has an Etsy store FILLED with other wonderful scents (including maple bacon and chai tea) so check her out if you missed this box and want one of her heavenly candles! Midnight Owl Candle Company in Autumn Leaves- This is an 8oz candle in a reusable, lidded mason jar. Autumn leaves fragrance is a mix of caramel apples, pumpkins and pie spices in an envelope of turning leaves. 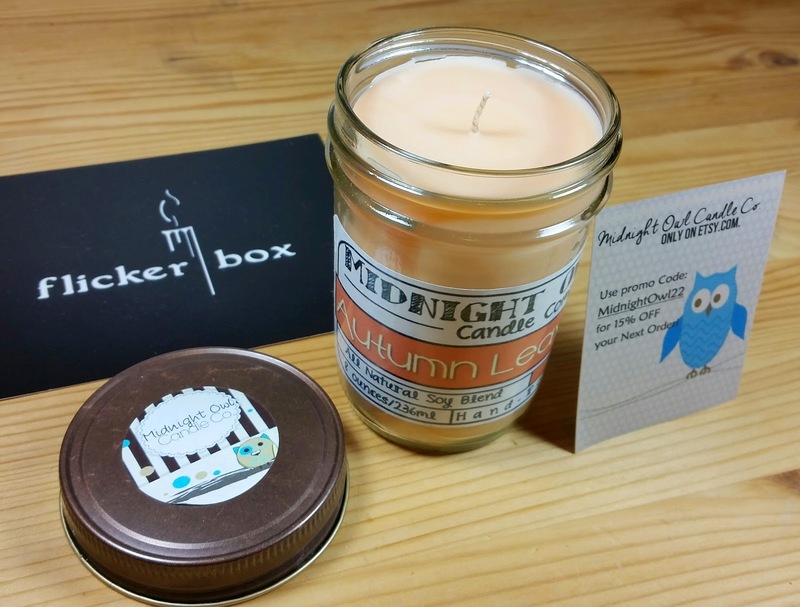 Midnight Owl Candle Co. strongly scented candles made with a secret wax blend which includes an all natural soy wax! All candles are made with the finest quality of ingredients and the freshest fragrances. These candles are long lasting and clean burning. Each candle jar is hand poured and made to last. I love the color and the scent of this. It doesn't smell like leaves, it smells like apple cider and cinnamon. I'm not sure there is anything better than that. Midnight Owl has more fabulous scents in both 8oz and 16oz Mason Jars. Scents like Toasted Marshmallow, Vanilla Sandalwood and Hot Apple Crisp. Head to the Etsy store to invest in some gorgeous, double scented candles! Use code MidnightOwl22 to get 15% off your order. Armadilla Wax Works Orange Cinnamon Votive-Orange and Cinnamon fragrances are blended together perfectly in this candle. This wonderful fragrance blend is essential for the fall ~ but great all year long! This votive will burn for 15 hours. I love this smell so much. It makes my mouth water. I want my entire house to smell like this. I wish they could make a pillow that smells like this so I could go to sleep smelling it. Although I might not want to get out of bed... Hmm..
Armadilla Wax Works Autumn Leaf Floater- This is an unscented candle with 7 hours of burn time in a gorgeous fall orange shade. The leaf shape is perfect and this is a pretty big candle. It's going to to look great in my fall arrangement. I might not even float it or burn it because it's so perfect. Also included in the box was a Halloween candy treat in a stamped canvas bag. A fun October touch, for sure! VERDICT: I adore the candles I received in this box. The value comes out to the price of a first box ($25). Candle subscriptions generally should equal the value of the box, especially for artisan goods, so I'm very happy with the value. I'm not sure but I'm guessing that the subsequent boxes at the $34 price range would include one more candle. I won't know until I get my next box, though, to be able to tell you for sure. I think this was an excellently curated October box. It's got some wonderful Fall scents that don't really bleed into the Thanksgiving/Christmas genre. I love each of these scents SO much and I'm already burning the Mulled Cider. The throw isn't spectacular but it's on my desk and it's all I can smell. *this box was received at a discount for review purposes. The discount in no way impacts my views on this box. All opinions expressed here are my own. Ooh I really want to get a candle box cause it seems like there are so many of them, but C is anti-candle :( He thinks I will burn down the house. I get so sad every time I walk by the candles in Bath & Body Works because....I WANT! My dad was anti-candle because he hates smells. I know. It doesn't make sense. We werent even allowed to use hair spray because it had a smell. So when I moved out, I went candle crazy! I never burned any of my houses down, either :D Thankfully, my husband doesn't mind candles at all, he likes them, so I can have as many as I want! I've never really been into candles... until I (recently) decided to burn the Nest candle that I got in my Nina Garcia box and omg it was so nice. But then I tried burning the Paddywax candle we got in a Popsugar box and it made me feel really sick. XD So I think I'm going to have to "screen" candles and only burn ones that agree with me lol. BUT THESE CANDLES LOOK REALLY AWESOME. I think that floater candle is the prettiest ever. :) They also earn bonus points for including candy!!! That Nest candle *is* nice! It smells so good I haven't burned it yet. I tend to hoard my candles, waiting for that perfect time but now I have so many I just need to use the dang things. I just ended up buying the full size of the grapefruit nest candle because I love it so much. XD I try to trade away most of my candles because I'm usually just not interested, but this one has totally changed my mind! Maybe?? I honestly have no idea, I just get a headache and feel grossed out. But it's all good - the nest candle doesn't do any of that to me! What a great box! I just love burning candles in the fall and winter...it just makes everything so cozy! I like that this offers up candles from different sources instead of one brand. I think I would've liked to have seen some kind of candle holder instead of a floating candle? Ooo! That's a great idea, I hope a candle holder of some kind appears in a future box ( subscribed for three months after I got this box). I agree that having several different brands is great and I already had to go and buy a couple other mason jar candles from the Midnight Owl Etsy store. I love the re-usable factor of both the lidded tin and the mason jar, too. This box is very high up on my wishlist at the moment. Funny about your dad - mine was super sensitive to smells too. When my folks split up my mom went crazy and bought a million "ocean" scented candles - silver linings I guess? Anyway, I'm glad my BF likes scented candles because I looooooove them! Oh no! That's disappointing to hear. I thought I read on the website that subscribers would receive a box equal to the purchase price. This box looks awesome! The candle fragrances sound like all the smells that I love. I was reading through the comments and saw that you mentioned you wished there was a candle holder...but isn't that a candle holder in the picture with the votive candle? Looks like it to me! I just started burning the Autumn Leaves one a few hours ago and it also smells amazing. It's a subtle pie spice and the throw is good, too. Haha! Yes, they all are IN holders, aren't they?! This box would not need a candle holder of any kind since they are all (okay, except for the floater) poured into their glasses/tins. It'd be a fun addition to another box, though, maybe the flat, dish type.